A new wormer monepantel, marketed under the brand name Zolvix, became available on 1st July 2017 in the UK, for use by farmers via SQPs, pharmacists and vets. 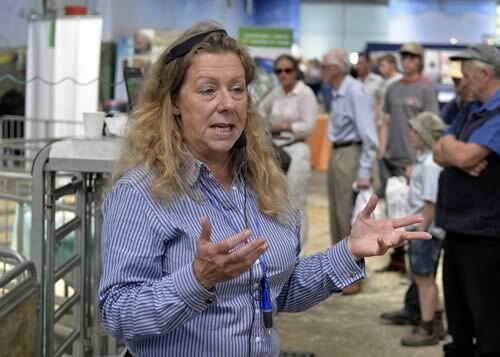 Independent sheep consultant Lesley Stubbings welcomes the product’s launch but wants to make sure farmers strike the right balance when using it. Ms Stubbings believes this is going to be a challenge and farmers will have to think even harder about what worming products to use and when. “The days when you could simply rotate product groups annually are long gone. In reality, most flocks will need to use three or more groups in a single season. For example 1-BZ for nematodirus, a 2-LV or 3-ML and then a 4-AD or 5-SI in the late season and for quarantine. “I would encourage my sheep farmer customers to take the time to talk to their SQP when they go in to buy wormers. Additional SQP training is underway so they can advise on product choices and suggest ways to monitor lamb performance and worm challenges”. Malcolm Sanderson farms in Lancashire and admits he was sceptical about the benefits of using a new wormer group initially. But with AR confirmed on his farm to two groups, white and yellow, he decided to take the plunge in September 2015 with his remaining lambs. Charles Sercombe, NFU Livestock Board Chairman and member of the Sustainable Control of Parasites (SCOPS) organisation, as well as being a sheep farmer agrees, but adds a note of caution.